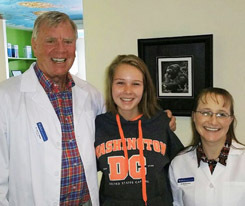 Dr. John Walker and the team at Walker Orthodontics near Westford, MA offer their patients orthodontic treatment for people who live or work near Westford, MA. They offer a variety of orthodontic treatment approaches that help ensure the best possible treatment outcomes. When someone mentions orthodontics or an orthodontist, people’s minds often race to images of a mouth full of traditional metal braces. Yet, orthodontists today can offer patients more than just traditional braces. Over the years, orthodontists have many treatment options at their disposal. Specifically, alignment of teeth or the re-positioning of the jaw are possible thanks to advancement in technology. One of the main treatment approaches orthodontists use to align and straighten teeth are traditional metal braces. Traditional braces are comprised of brackets, wires, and bands that straighten your teeth and which are continually tightened over a prescribed amount of time. Dr. Walker also offer patients near Westford, MA treatment with light-colored ceramic braces (for patients who do not want their braces to be noticeable) and even fun clear-colored bands for his youngest patients. Braces can also be indicated for patients with overbites, underbites, or overcrowded or gapped teeth. Braces are used by many patients to achieve a perfect-picture smile. With this in mind, it makes it a great option for othodontic treatment near Westford, MA. When baby teeth are lost earlier than normal, space fillers are used so that the neighboring teeth do not grow into the space meant for the adult tooth to grow into. These space maintainers are used to keep the gap open until more childhood teeth fall out and the adult teeth begin to grow in. Fixed space maintainers work with a band that is attached to one tooth and a wire. In addition, it is extended across the gap to the tooth on the other side to stretch and keep the gap open. Sometimes called splints, jaw re-positioning appliances are used to adjust either the upper or the lower jaw. This is done so that the whole jaw structure performs more naturally. Most often, this appliance is prescribed for patients with temporomandibular joint disorder (TMJ). In some instances, patient’s lips and cheeks can put pressure on their teeth, causing pain or discomfort. Walker Orthodontics recommends lip and cheek bumpers for these patients to help keep the lips and cheeks away from the teeth. As a result, it reduces or eliminates the pressure, pain, or discomfort that the patient is experiencing. A palatal expander is used to widen the curve of the upper jaw. It is a plastic tray which fits on the roof of the mouth. Thus, it helps to better align the bones and joints in the mouth. Retainers are used to keep teeth from shifting back to their original position. This is necessary is after orthodontic treatment with braces or Invisalign. Retainers are a plate that is placed on the roof of the mouth; a wire runs across the outside of the front teeth. Retainers may also be constructed as a plastic aligner. More often than not, these aligners are worn during the night. Headgear, usually, is a strap placed around the back of the head, which is attached to a metal wire in the front of the mouth. Orthodontists prescribe headgear for patients who need to slow the growth of their jaw and to make sure that the patient’s teeth are in the right place and fit nicely within the jaw. Walker Orthodontics wants to make sure you receive the perfect orthodontic treatment in Westford, MA with braces. The most appropriate plan of orthodontic treatment is the first step. Orthodontists in Westford today offer a lot more treatment options than just traditional metal braces. The professional team at Walker Orthodontics prescribe treatment plans for a variety of oral health care-related issues, including the alignment of teeth and the re-positioning the jaw. For more information, or to schedule an appointment with Dr. Walker and Walker Orthodontics, contact us at (978) 456-8902.